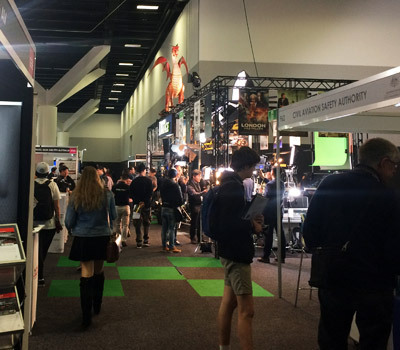 Preferred Media has set yet another milestone by exhibiting at the recent SMPTE event. We have been an avid supporter of industry events for years, notably associated with SPA (Screen Producers Australia) and short film festivals like the Dungog Festival. This year, for the first time we presented our unique service in a larger public forum. Our experience at SMPTE was extremely good. SMPTE attendees are concerned about managing content. Despite apparently lower attendance this year, our stand attracted considerable interest. It’s clear that more and more people are concerned with the growing amount of content data generated. It was inspiring to meet so many people interested in our managed service model. They recognise that data does not simply sit idle at any time, whether during project development, distribution or afterwards. Content is vitally important to all film makers, content producers and enterprises. So there’s a universal need to hold content in a way which not only makes security a non-issue, but more importantly enables quick, painless search, manipulation and repurposing. Preferred Media’s MediaPhile platform makes content data asset management both a reality and financially feasible. It’s a combination of robust technology and our expertise in content management. David and Phoebe at the Preferred Media stand. SMPTE is about looking toward the future. It’s a forum to demonstrate technology and advances driving the motion picture and television industries forward. Yet today and tomorrow build on a long and proud history. 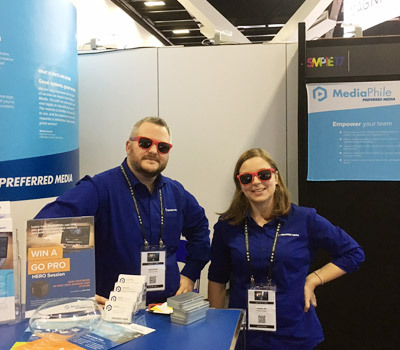 Preferred Media’s full service range focuses on metadata, accessibility and delivery. It is the ligament linking old, current and new. MediaPhile puts you in control of your digital media. Our physical media archive (including online catalogue) means clients can preserve and access their past content. And extensive digitisation options make that content available for re-use and repurposing. In conclusion, we are glad to have participated at SMPTE 2017. We look forward to the next show and future opportunities. Congratulations to our Go-Pro HERO Session winner, John Waterhouse of Night Owl Film & Media Services! To find out more about MediaPhile, please contact us. We’re happy to arrange a demonstration or a free trial.